Being a dietitian, I'm regularly approached by friends, family and sometimes strangers, looking for advice on how to lose weight. It always comes as a surprise when I tell them I don't do weight loss. Eyes squint. Heads tilt. Jaws drop a bit. They're thinking, "Ummmm, aren't you a dietitian? Isn't that, like, what you're supposed to do?" As a dietitian and heath care provider, my job is to empower people with skills, knowledge and the confidence to improve their health. My goal is health, not thinness. And thinness does not equal health, nor is achieving thinness a guarantee of health. Furthermore, fatness does not equal sickness or lack of health. That's because health is not a size. I'm not a weight loss dietitian because science doesn't support the idea that permanent weight loss is achievable for more than a small minority of people. You may have seen last weeks article in the New York Times on the study done on The Biggest Loser participants. The study showed after losing (and often regaining) weight on show, their bodies burned about 500 calories less than expected for their size. That, along with the fact that their bodies were producing more of a hormone that stimulates hunger, and less of a hormone that blocks hunger, is the the likely reason why all except one had regained most or more of the weight they lost. Many read this as shocking new news, but really, this has been well known in the field for years. While study after study fights over what type of diet or eating pattern is most helpful for weight loss (all looking at the first 2 years), study after study shows the vast majority of dieters regain weight the weight they lost, and 60% regain even more. A lot of people get discouraged when they hear this, especially if you've been told most your life that health (not to mention, your value as a human being) is dependent on thinness. You might just feel like giving up. In my practice, I embrace a paradigm called Health at Every Size (HAES). Simply put, HAES encourages health-promoting behaviors with the goal of health, not weight loss. HAES practitioners don't use your body size to assess your health because we know that it isn't very good at that. Many studies show "overweight" or "moderately obese" people live as long, or longer than those who are in the "normal" weight BMI category anyway. Instead, we evaluate health in a much more holistic way, looking not only at presence or absence of physical/mental illness, but fitness, social connectivity, eating patterns and relationship to food, sleep, stress and so much more. This may be a scary or uncomfortable thing to hear if you feel unhappy at your current size. Besides the societal pressure to look a certain way, we've all heard so much information about the dangers of fat, making the idea of being "overweight" somewhat terrifying from a health perspective. But a lot of the research we hear with scary health statistics is misrepresented. It's not an "obesity epidemic," it's a crappy lifestyle epidemic, a poverty epidemic, a stress epidemic. Weight gain is simply one side effect that some people experience. Others do not. If someone engages in unhealthy behaviors, yet does not gain weight, the medical community often overlooks their higher risk? Focusing on something we can't control (i.e. weight) and not something we can control (i.e. behaviors), creates a huge distraction. Your actions will end up addressing the number on the scale, and usually in a way that's not sustainable. When you focus on weight, you eliminate sugar instead of looking at why stress is leading you to overeat candy and muffins from the snack room everyday at 3 pm. When you focus on weight, you go to the gym and pound away on the cycling machine for 45 minutes then don't move the rest of the day because you already got your workout in, rather than finding exercise you enjoy and can sustain and working movement in throughout the day. When you focus on weight, you give up and resort back to unhealthy behaviors when the scale stops moving, because even if the behavior changes you made were healthful, what you're doing "isn't working." Focusing on weight loss as an outcome also marginalizes those who have larger bodies. Size diversity is a real thing. Just like some people wear a size 6 shoe, while others wear a size 9 shoe, waistlines and hips and thighs come in different sizes too. Who am I to say a 250 lb ultramarathon runner, a plus-sized yogi who can hold advanced poses that I can't get into even for a split second, or a zumba instructor with "200 pounds to lose" are unhealthy? These are a few of many, many examples of people who are eat normally and are active, yet have a BMI that was categorize them as having a disease. Sure, they could go on a diet, but science tells us there's a 95% chance it will do more harm than good. Even if weight was a problem, would you take a pill or undergo surgery that had a 95% chance of making your condition worse? As a dietitian and health care provider, I have a commitment to first do no harm. And diets do harm. That's why I consider myself a weight-neutral dietitian. The number on the scale isn't a marker I use to measure progress. I don't even have a scale in my office. Size acceptance. No matter your size, I accept you as you are and I work to help you do the same. No one knows what size you are supposed to be, so let's work on appreciating your body as it is now. I've said it before and I'll say it again - you can't take good care of something you hate. Building body trust. You have internal systems in place that are designed to keep you at a healthy weight, but years of dieting have suppressed those cues and signals. 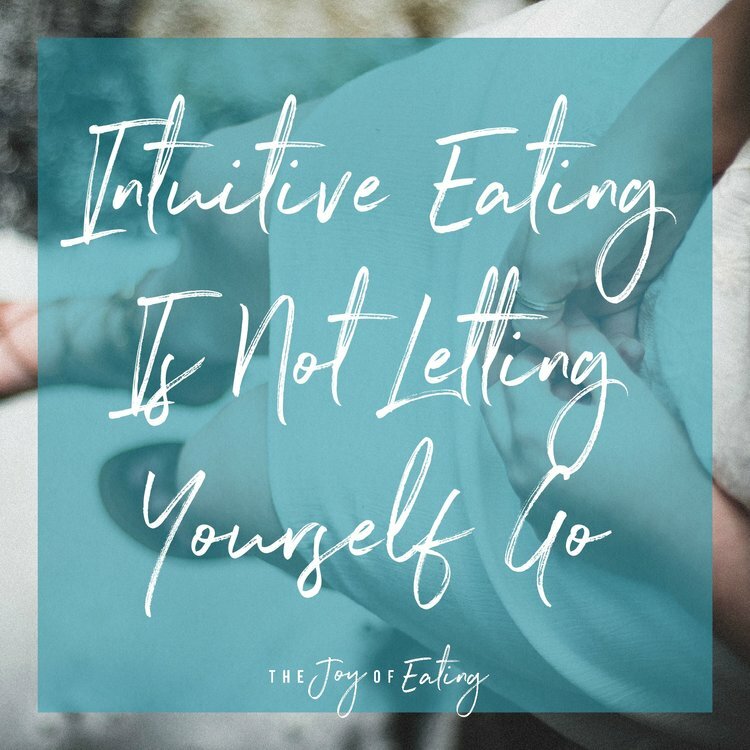 Using intuitive eating strategies, we'll tap back into those cues so you can eat when you're hungry, stop when you're full, and savor foods you love without setting off a cascade of guilt, shame and binging. Adopt healthy lifestyle habits. Habits are things you do consistently without even thinking about it. Using a small step approach, we create healthy habits that make it easy for you to enjoy tasty, nutritious and balanced meals, move your body regularly and support your emotional needs. And what about your weight? Because let's face it, you can logically know all the statistics about dieting and body diversity, but that doesn't mean that you'll wake up and feel comfortable in your skin. I know it’s scary to put your trust into something where you don’t know the outcome. Well, I can tell you for sure that one of three things will happen - you’ll lose weight, gain weight, or stay the same. I know, that probably doesn’t help to ease fears, but do know that unless there is something medically going on, your body is not designed to continue to gain weight without stopping. And whatever happens to your body, that has no baring on your worth as a human being. If you're interested in working together on a weight-neutral approach to your wellness, please feel free to check out my coaching philosophy and coaching services and shoot me an email. Happy to set up a free 15 minute phone consult to discuss your needs and see if we'd be a good fit to work together! I know Health at Every Size principles may be new to you, so feel free to message or comment with any questions or concerns you might have!